Tonight the executive chef of East & Main Bistro of Wellington, Ontario in Prince Edward County is competing in the regional Gold Medal Plates competition in Ottawa. 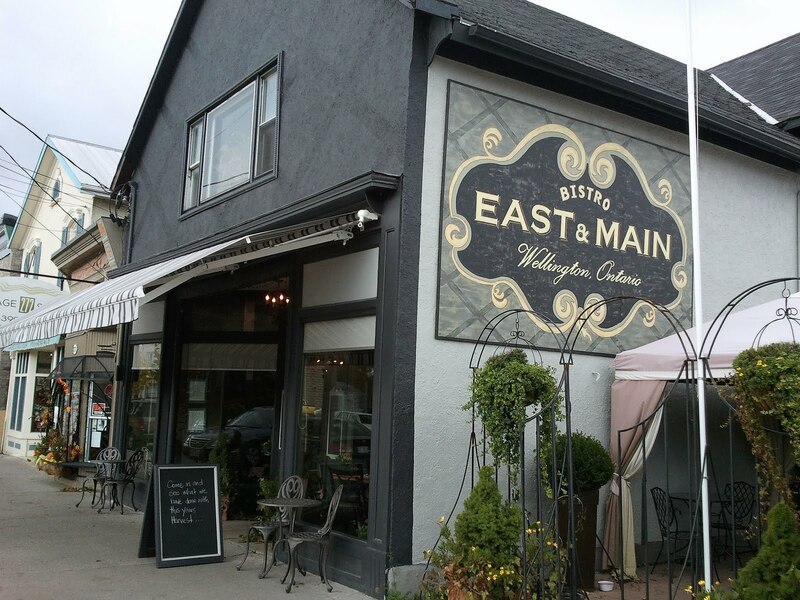 Lili Sullivan has been the chef at East & Main since 2009. My first experience with this place occurred when we took a weekend vacation to the County at the beginning of June this year. But the closest we came to eating Lili Sullivan’s fine foods was a box lunch on a farm tour as part of the Great Canadian Cheese Festival. Though it wasn’t any old box lunch by my way of thinking. I loved every bit of the vegetarian sandwich wrap, salad, to-die-for brownie and extra fixings. A few months before I read through Ron Eade’s Omnivore’s Ottawa blog that Chef Sullivan was going to be participating in Gold Medal Plates come November. A great box lunch doesn’t necessarily give you great insight into whether someone can capture the GMP crown. I needed an excuse to return and sit in for a fuller East & Main experience. That chance came last month when returning to Ottawa from an out of town trip. Not a lover of the steady hard pavement of the 401 with its unpredictable truck traffic, I meandered off the highway past Brighton to take in the County. 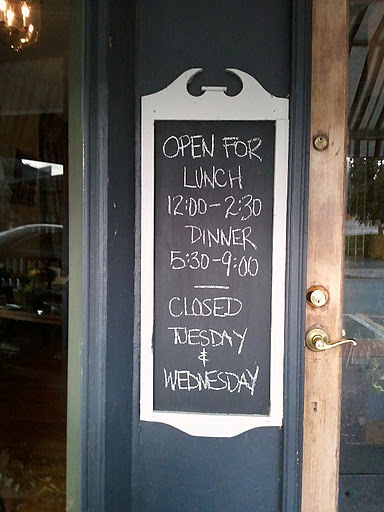 And with luck, catch lunch at East & Main. Fall had set in and the drive down Highway 33 was beautiful. The Loyalist Parkway curves by Lake Ontario just before it heads into Wellington. I arrived remarkably rested. Owners Kimberly Humby and David O’Connor understood the clientele that would enjoy their bistro when they opened two years ago. As I sat down for lunch, my keen people watching instincts told me that I was surrounded by locals, regular visitors and tourists alike. And of course, the very food focused curious, like me. This is a destination place. The interior is welcoming. Upscale touches to the finishings but still a cozy feel. In one of the bay windows they have placed a dining room table that can comfortably seat 6. On this day, it was occupied by four well-dressed ladies that, by my estimation, made this outing a regular event. In the other bay, were smaller groupings of tables to make room for a full wall buffet of their homemade preserves. 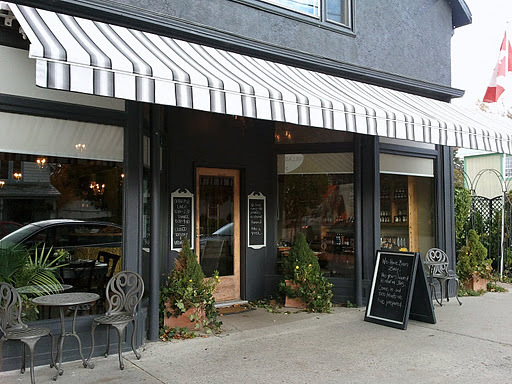 The menu offered 4 appetizers – soup, salad, trio of tapenades & pita crisps, and a pâté plate. There were also 6 sandwich choices ranging from $10 to $14. They came with your choice of soup, salad or frites. The 4 mains ranged from $12 – $13. Pasta, stew, quiche and a composed salad. For my sandwich I went with one of the new offerings on the menu. 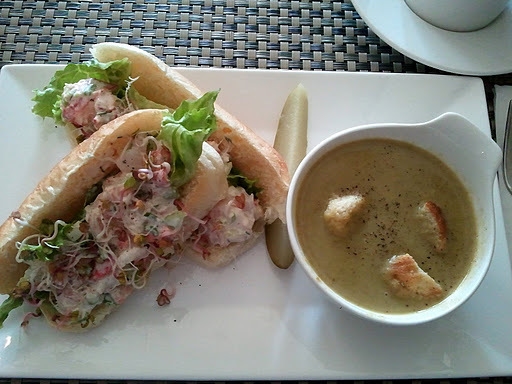 Lobster and shrimp roll with smoked tomato tartar sauce on mini pastry house rolls from Pastry House in Picton. (The same bakery that supplies The Buddha Dog their great rolls.) Pastry House rolls are some of the best I have ever tasted. They risked stealing the show; however, the seafood filling was superb. Not to mention a handsome portion. I chose to have it with the soup du jour, leek and asparagus. I loved the creamy, silky texture and full flavour but I am not a gal who goes in for big croutons. I would have enjoyed a garnish with a bit more of a dressy look. My sandwich plate rang in at $14. I was likely full enough after the sandwich and shouldn’t have considered dessert, knowing that I had a sedentary 3 hour drive ahead of me. But the menu beckoned. I passed on the Mexican chocolate cake, crème brûlée, honey panna cotta and lemon curd tart. 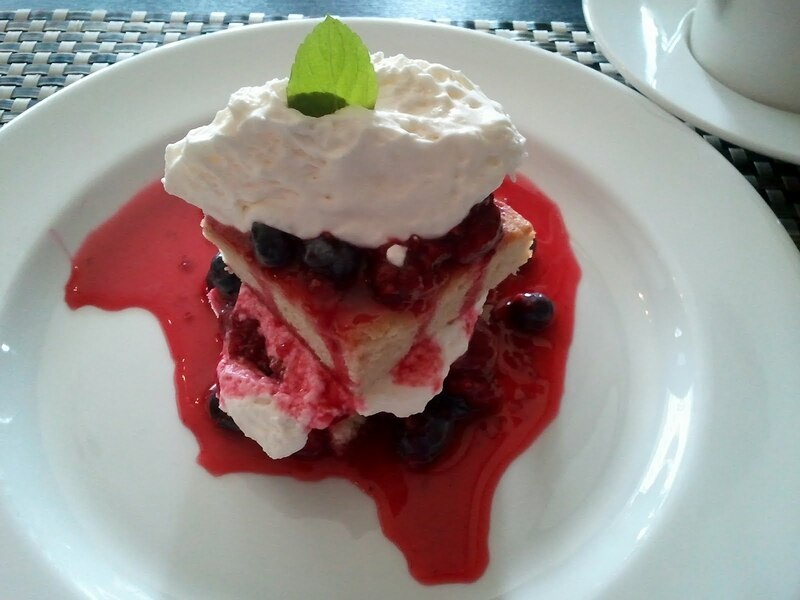 Instead, I chose the fresh berry shortcake: cardamom pound cake with macerated berries and cream. ($8.00) Being a Dane, cardamom is a much loved spice in baking. The cake had the balance of denseness needed to stand up to the juicy berries without being too heavy. Another hit. I had a hard time leaving. It is a place you settle into and feel the comfort of home. Before I paid my bill I wondered to the wall of preserves to check out their creations. Owner, Kimberly Humby was restocking the shelves. 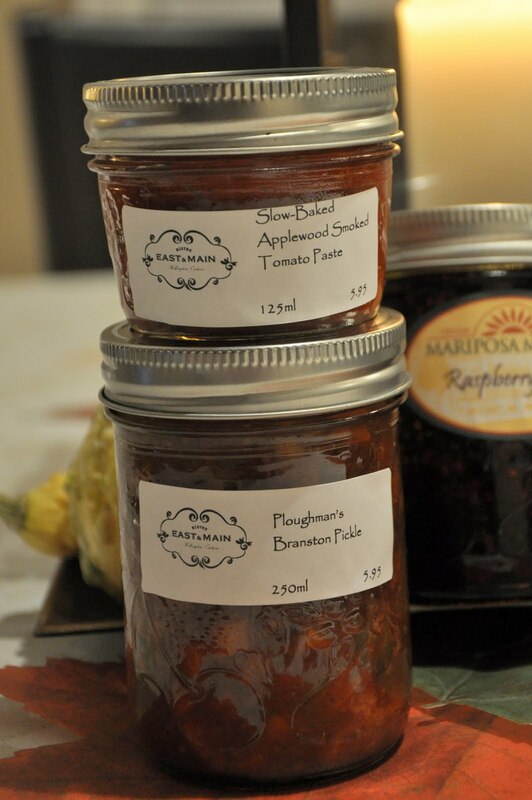 She enticed me with the laborious love that goes into the Slow-Baked Applewood Smoked Tomato Paste (125 mL jar for $5.95) and the Ploughman’s Branston Pickle (250 mL jar for $5.95). Having just put away so many jars of tomato creations myself, I had to know every detail of the Tomato Paste. She indulged me. Considering all the work, I was starting to feel like $5.95 was a bit of a steal for that wee jar. Kimberly shared with me that their preserves are made with vegetables from their own garden and also from farms nearby in the County – Laundry Farms on County Road 1, Hagerman’s Farm between Bloomfield and Picton on the Loyalist Parkway, and Vicki’s Veggies on Morrison Point Road, near Milford. Ottawa Magazine recently did an interview with Lili Sullivan before the GMP competition. The week before, The Ottawa Citizen had an article entitled “Five Worth The Drive” focused on destinations for wine tasting. East & Main Bistro was included. It appears the word is getting out. The food, wine and beautiful countryside make Prince Edward County a vacation retreat from the big city. There are so many great places to eat in the County, it is hard to cover them all in a weekend. 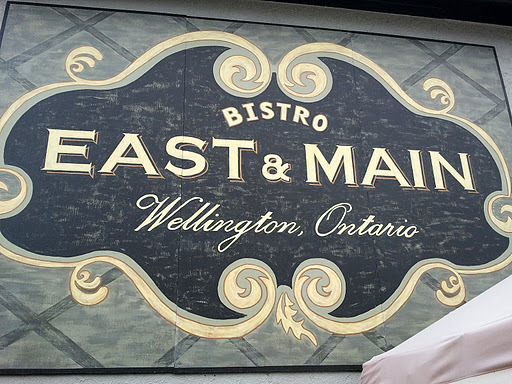 If you can work East & Main Bistro into your itinerary, you won’t be disappointed.